PRICE DROP: Just lowered to 799,000 US$. 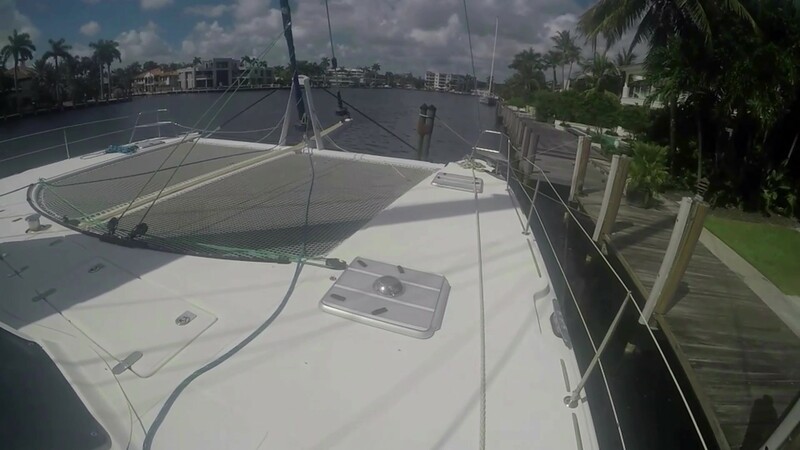 Perfectly maintained 2001 CATANA 582, Special Edition CALIGO for sale. 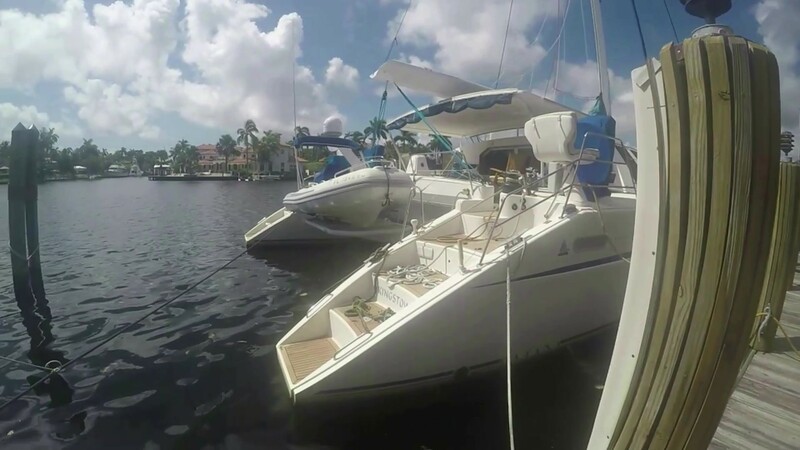 Experienced owner couple are selling boat as they are upgrading to a larger catamaran. 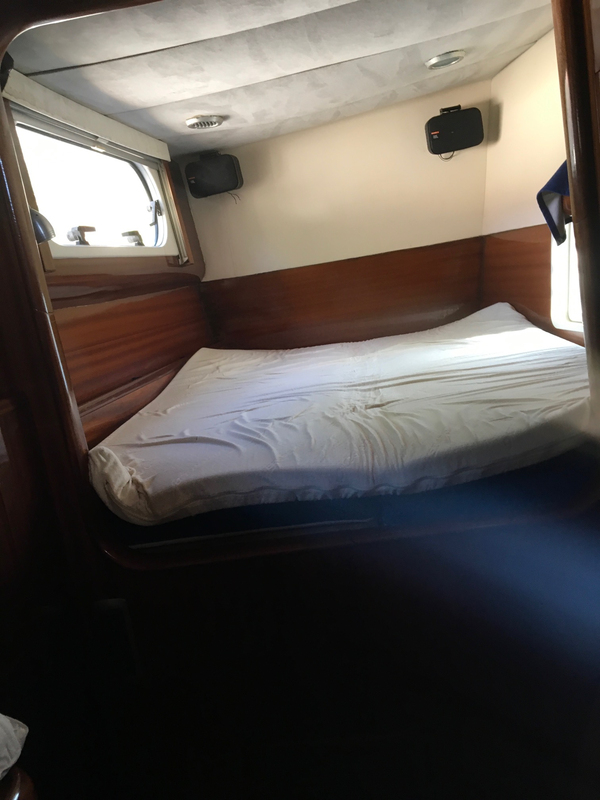 Never chartered, rare owner version – new on market. 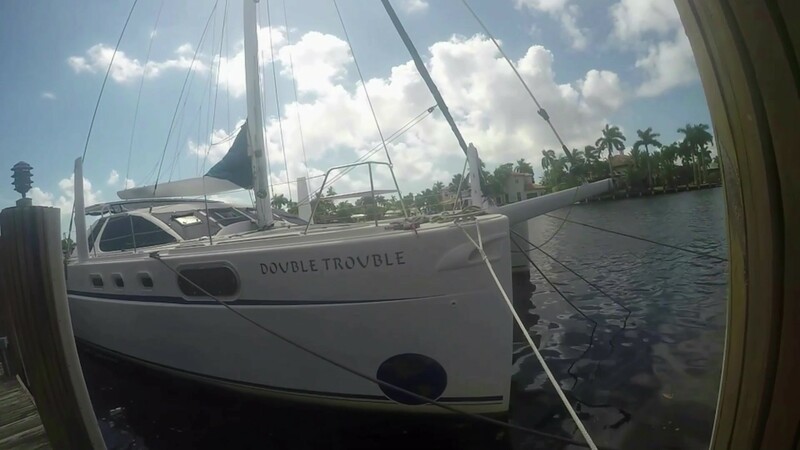 Double Trouble is a Catana 582, hull 6, delivered from the factory in Canet France in July 2001. The interior was designed by the Caligo design group & most of the early 582 where “Caligos”. The earlier 582’s also had an integrated front cross beam & longeron/bow sprit, instead of two separate beam & bowsprit. 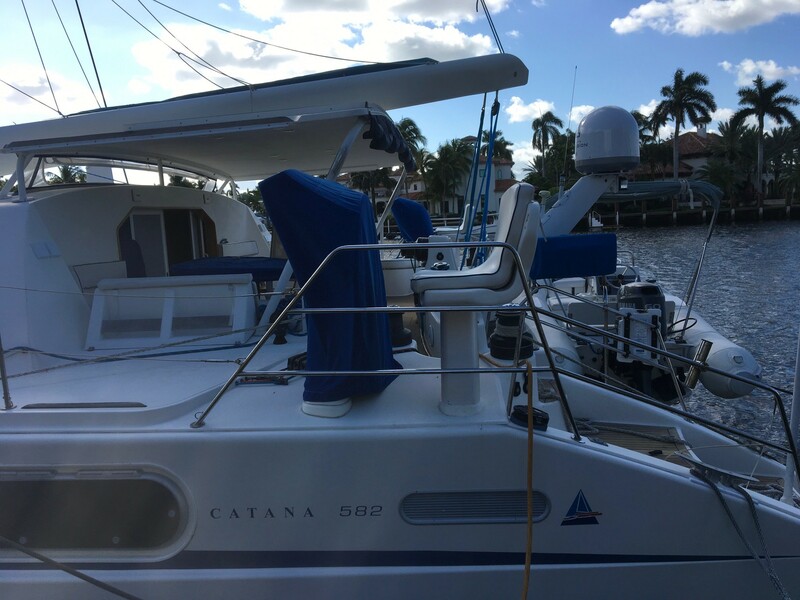 They also had the large “Park Avenue” boom, which Catana replaced with a cheaper boom on later models. 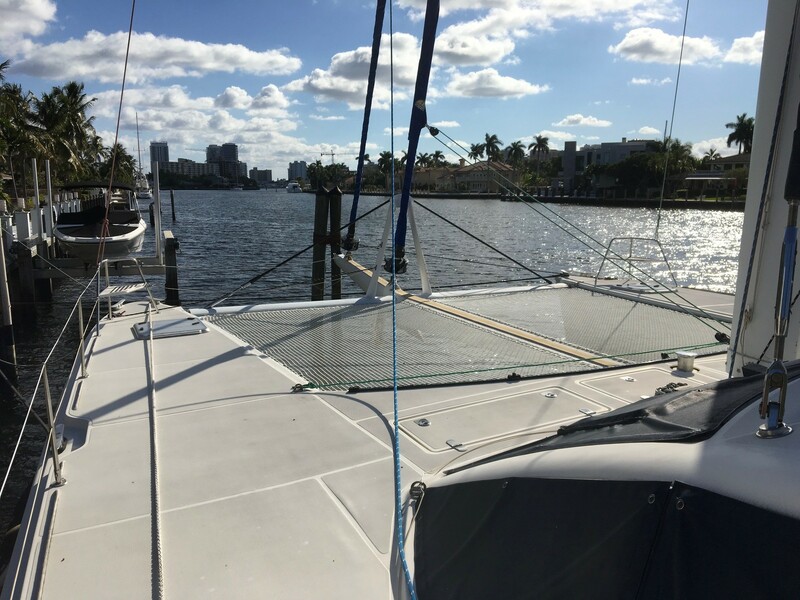 The boat uses closed cell foam, with an inner skin of Twaron fiber (a form of Kevlar). Bulkheads are carbon fiber skin over a honey comb composite. This is a 582 model as opposed to a 581. 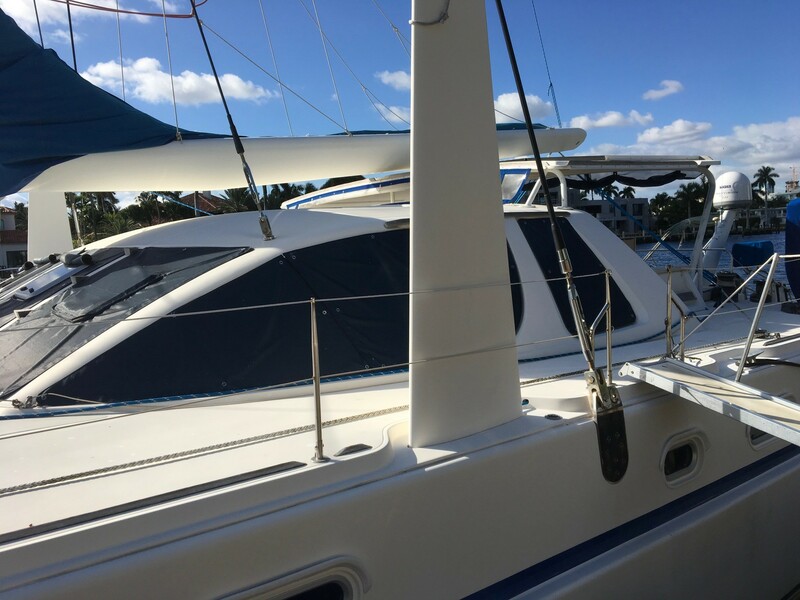 The main difference is better helm stations, the tender lift instead of davits & it came with most options. The 581 was a basic boat you added to. The stripping & decals where replaced at the last haul out. A new trampoline is on order (trampolines last about 5 years) & the anchor chain is being updated. 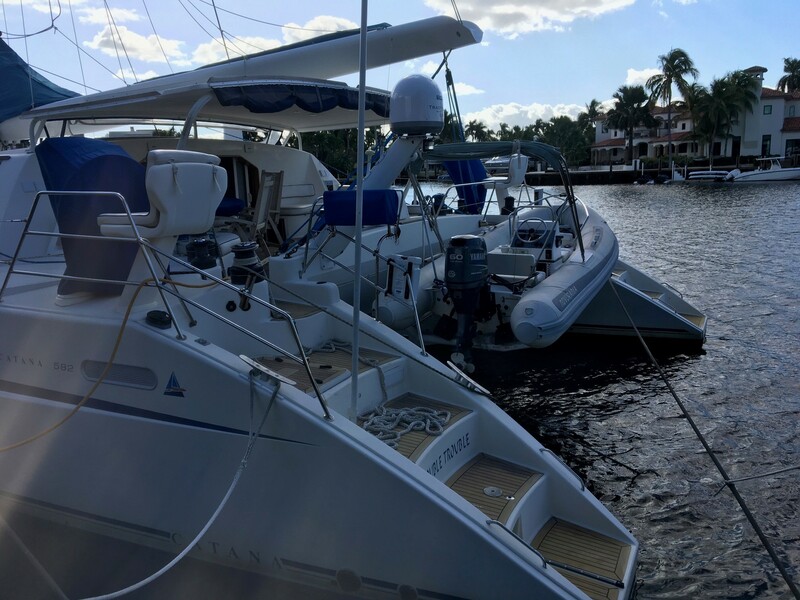 This boat resides behind owner’s home in Ft. Lauderdale, FL so she gets a lot of attention, constant maintenance & is used often. Fuel: Three 150 gallon tanks. 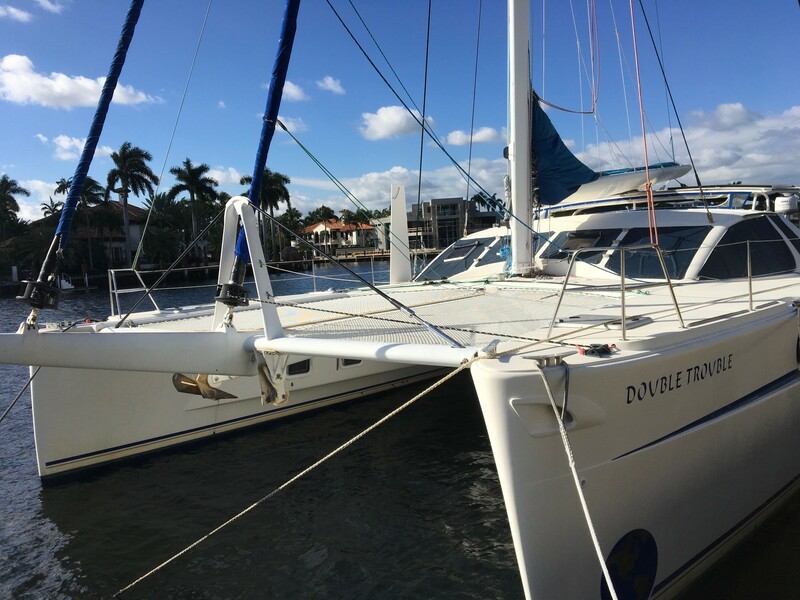 Two forward on either side of the mast & one in the aft deck under the port locker. The two tanks forward run the engines on that side & the aft tank can run each motor & the generator. A bank of valves in the aft locker, control the flow of fuel. Generator: 12.5KW Phasor generator in the port engine room. Remote start/stop in the Salon area near the entry way & a control on the Generator operate the unit. Hours 4322. The generator was replaced about 8 years ago. Power: 240VAC, 50A 100 foot cord, feeding an Isolation transformer in the starboard engine room. Six 12V 200AHR AGM batteries, arranged in pairs, provide 24VDC at 600AHRs. 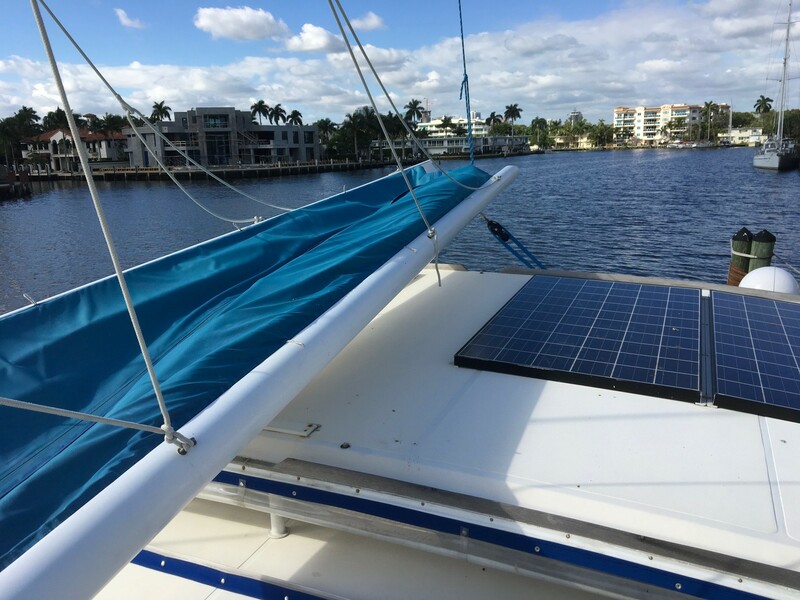 Batteries are charged by a 60A/3.7KW charger/inverter (Outback), the two 75A alternators & four 245W solar panels on the bimini, controlled by a Blue Sky MPPT solar controller. Water: Two 150gallon tanks integrated into each hull. Two Headhunter Excalibur pumps in each engine room. 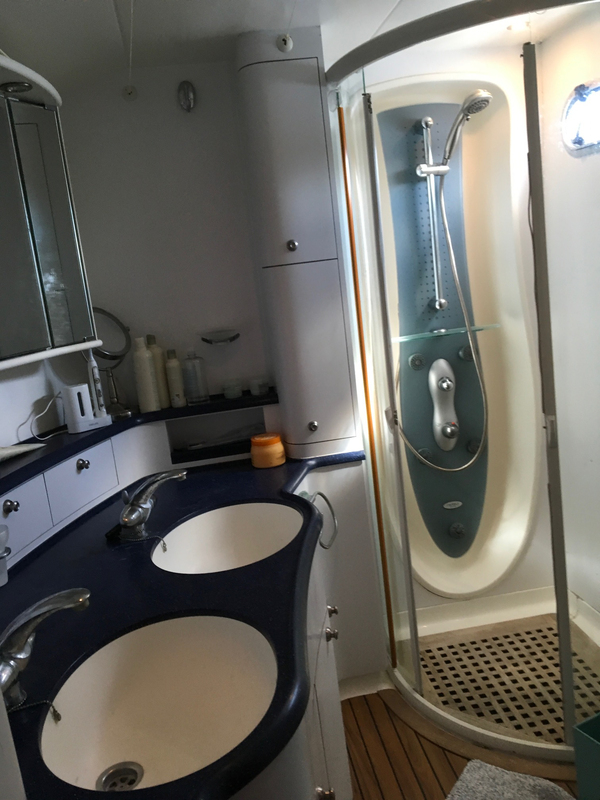 A 65G/H AquaWisper watermaker in the starboard engine room, run the water system. Valves in the port engine room let you tie the two separate systems together. The water tanks in each hull along with the engine room bulkhead, separate the bulges into three compartments, each with it’s own pump. 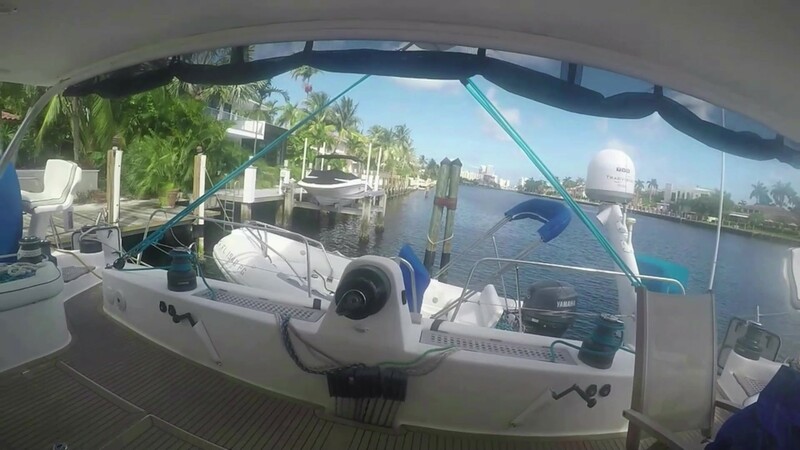 Tender: A 430 Noverania tender with a 60HP Yamaha sits on a lift. 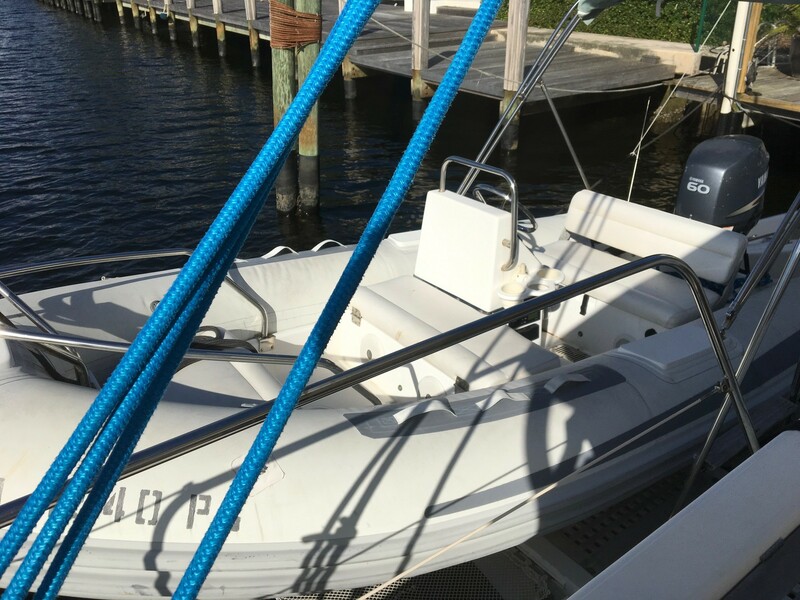 The tender has full Yamaha electronic displays, VHF radio, four speaker Fusion radio with BlueTooth & a bimini. 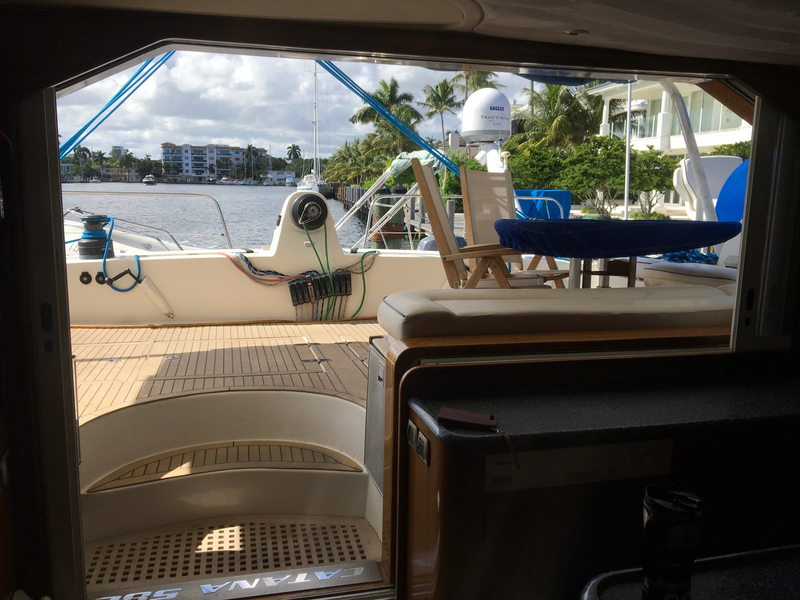 The lift, by Tenderlift, is hydraulic (unit is under the seat aft of the galley sliding window), with a switch on the lift, another by the utility wench & a remote. There are spare remotes. Sails: We carry four sails. 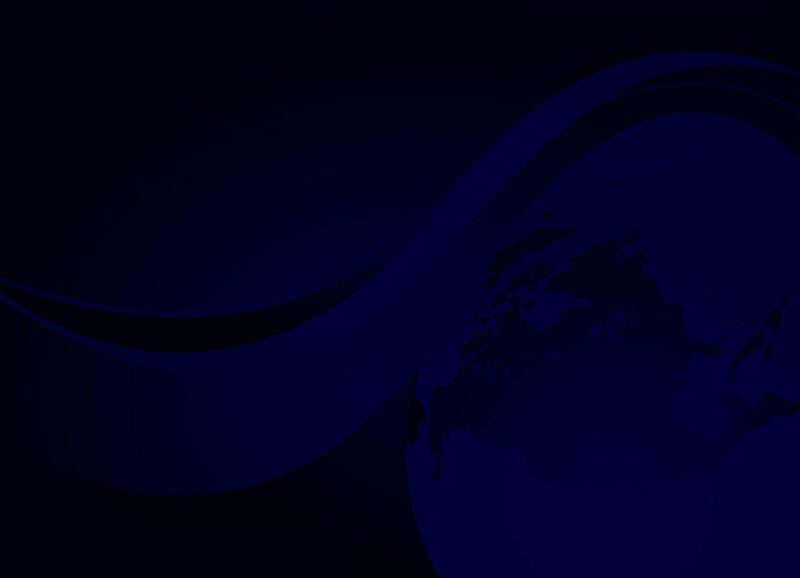 The main is five years old. The self-tacking jib is new. 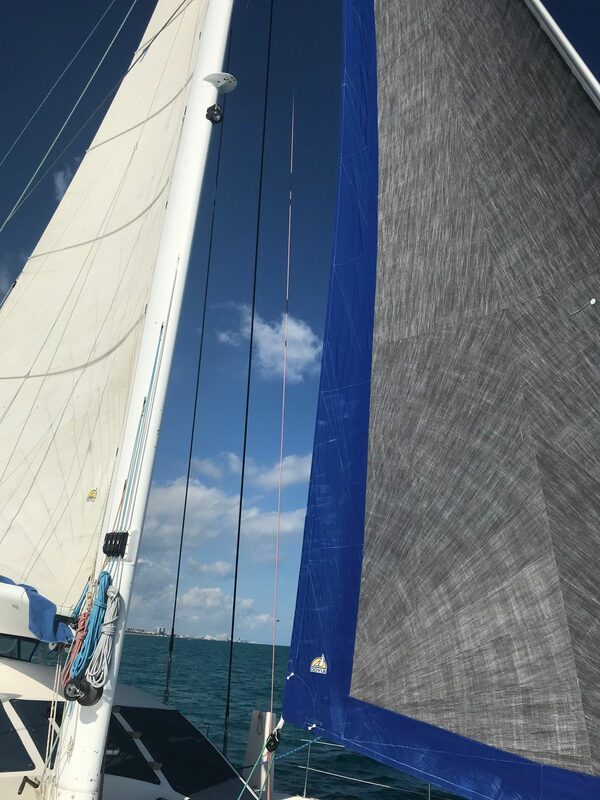 The spinnaker is 7 years old & is an A Kite. The Reacher, comes in two versions, old which we use most of the time & a carbon one we use for racing. The reacher is designed to sheet inside the shroud & in winds under 15KN, with the dagger boards down, is an up wind machine. Winches: There are ten wenches, five 66 Harken three speed & five 53 two speed. All but the small one on the mast are hydraulic. Each engine room has a hydraulic assembly to run the wenches on that side of the boat. 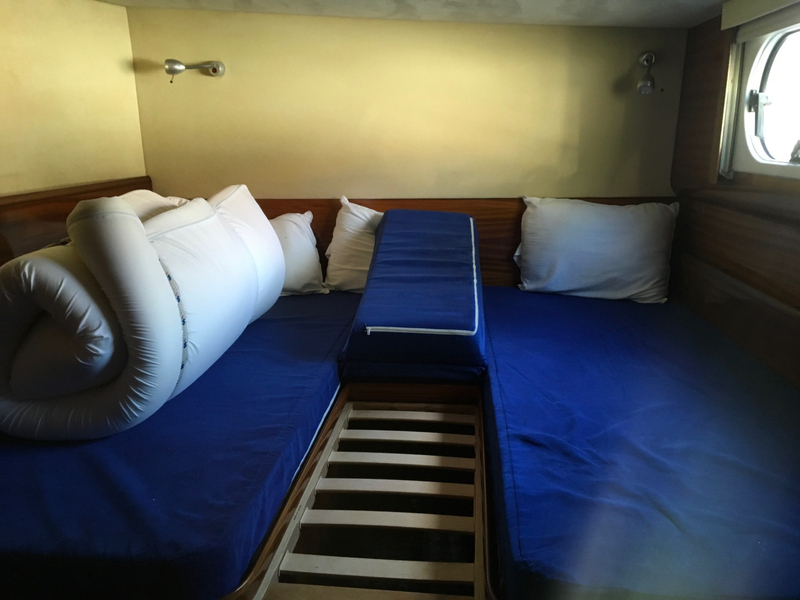 The boat has dual main sheets (small wenches) that make room for the utility wench in the middle (three speed). There is a bank of ten stoppers that feed this wench, which feed a pully assembly underneath, with the lines going under the boat to a pully assemble under the mast. This allows total control of the main from the cockpit aft. 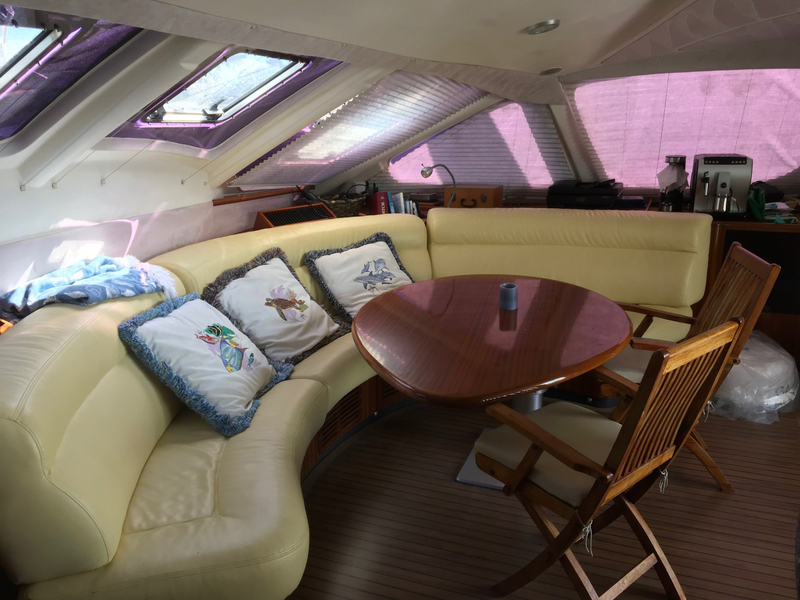 There are three aft reefing lines, three forward reefing lines, the main halyard, topping lift, out haul & jib sheet controlled back here. On each side around the helm stations are three wenches. 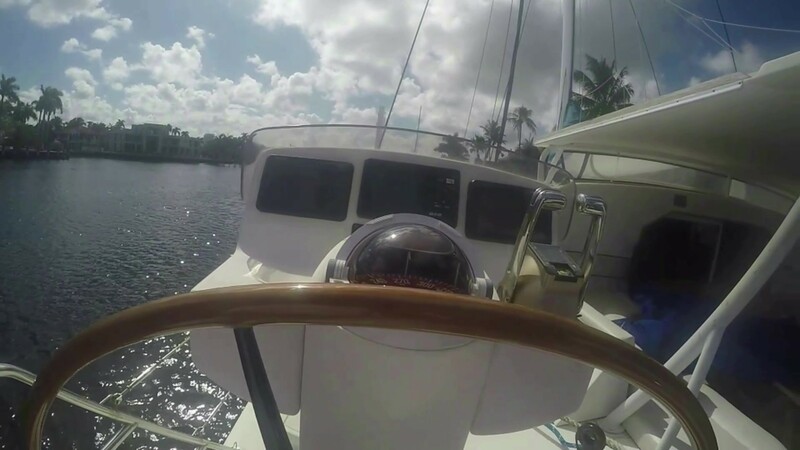 A three speed for the Reacher, a three speed for the spinnaker & a two speed utility wench to control the jib or Reacher roller, the spinnaker guy & the dagger board lift. 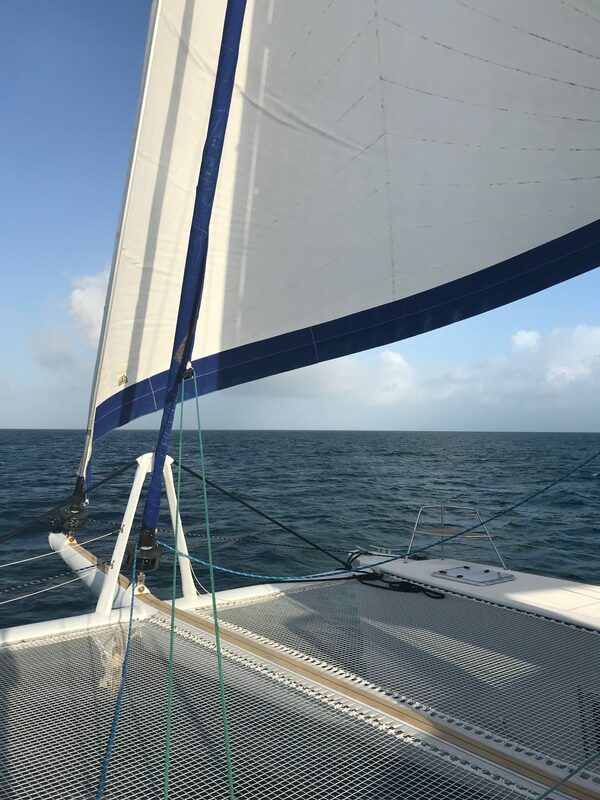 The only reason to go forward is to deal with the spinnaker. Navigation: We use a PC running Rose Points Coastal Explorer software. A Garmin 5212 display is a backup chart plotter & is the Radar display. The wind instruments are B&G 2000. 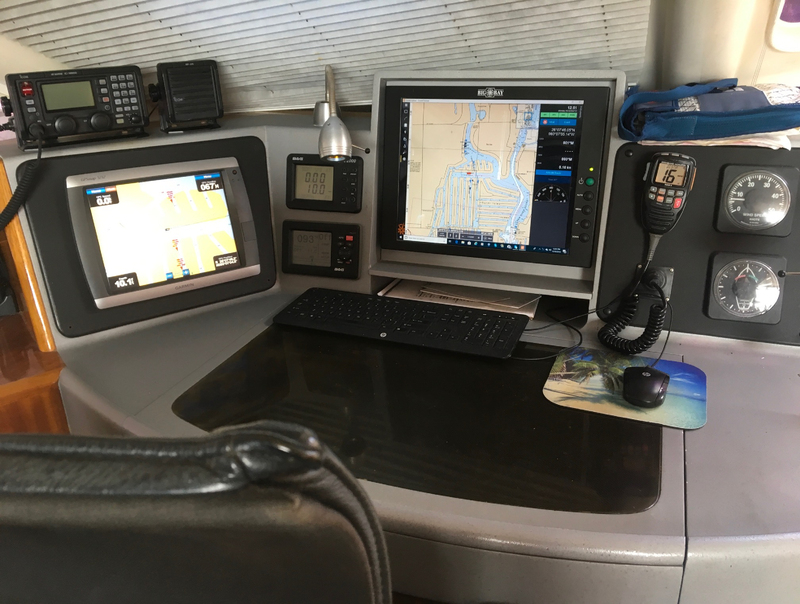 There is two general purpose FFD (fully functional display) at each helm station, one at the navigation station, & one in the owner’s cabin. 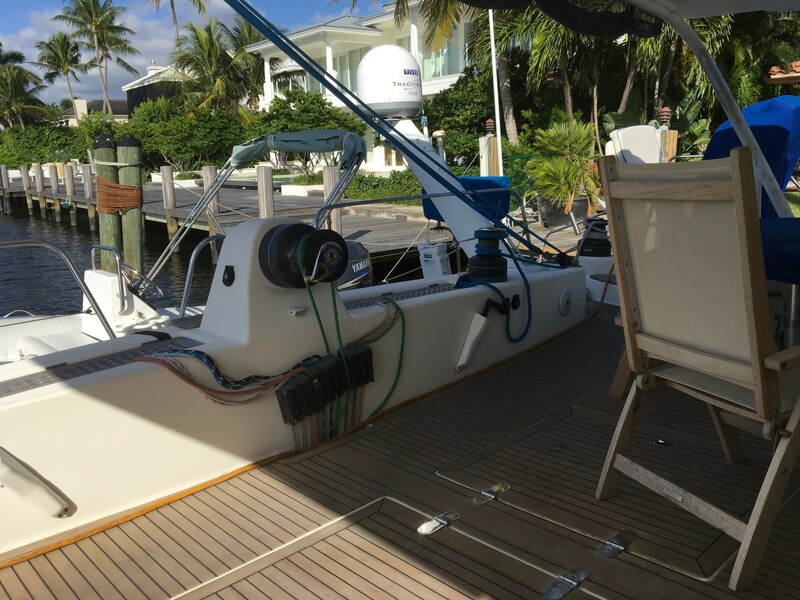 The auto pilot is a B&G 3000, with a Ray Marine ram in the starboard engine room. A display at each helm station & at the navigation station. 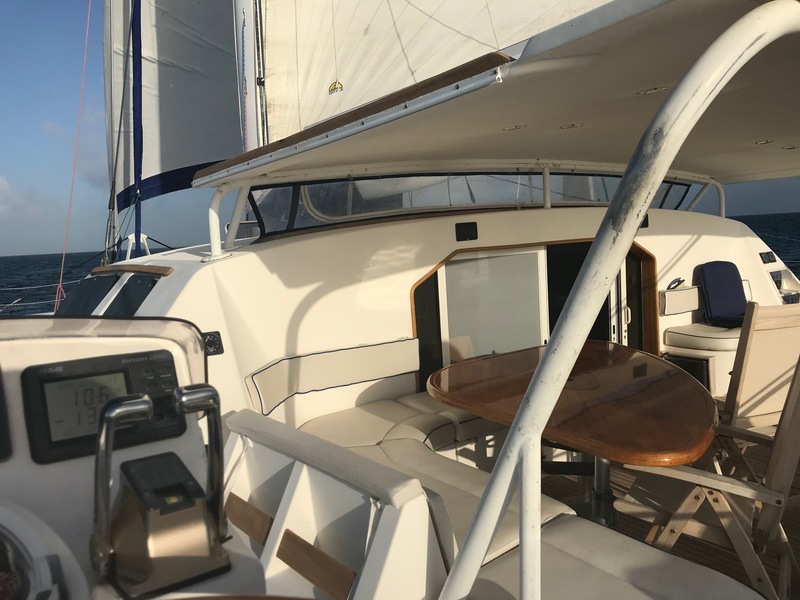 In addition, two 20/20 displays over the entry way & three sets of analog apparent wind & direction displays, across from each helm station & at the navigation station. 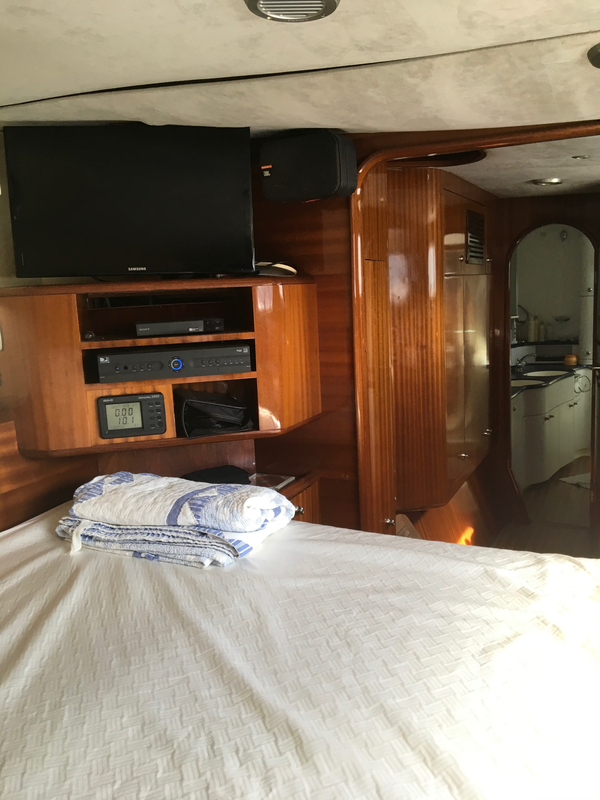 The VHF is a Standard Horizon Phantom series with a Ram mike at the navigation station & one at the starboard helm station. A hand held Icom VHF is in a charger at the Navigation station. A Icom M802 SSB is also at the navigation station. A Class A AIS, under the navigation station, is integrated with both chart plotters. 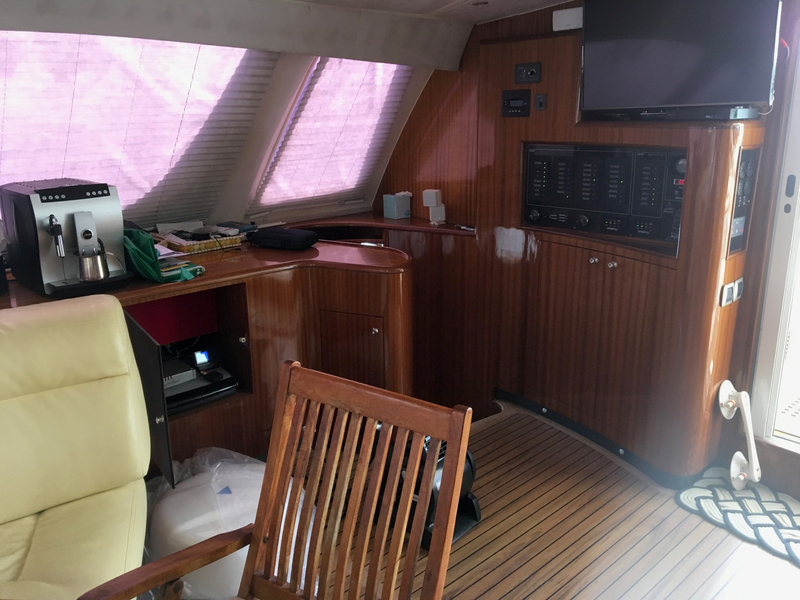 Galley: A 200 L refrigerator, 100 L freezer, a 100 L freezer in the port bow, a drink cooler & an ice maker in the salon entry keep your stuff cold. The salon freezer, refrigerator & drink cooler run off the batteries. The freezer in the bow is AC/DC & the ice maker is 120VAC but will run off the inverter. 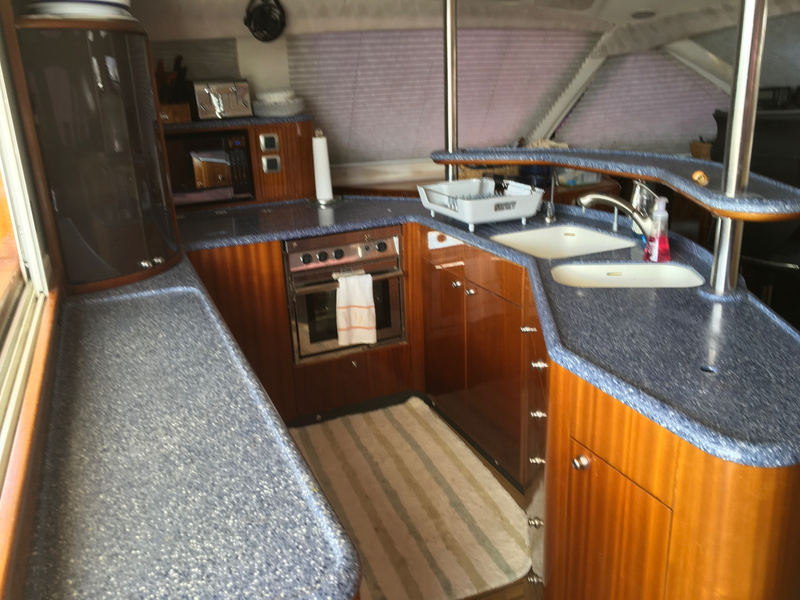 Three burner Force 10 stove (3 years old), microwave, two bin sink & a Miele dish washer round out the galley. 20Lb propane bottle runs the stove & a 10Lb runs the grill mounted on the port inner rail going down the stairs to the water. Entertainment: A Bose Lifestyle surround sound with an outside amp for the cockpit provide the sound. An XM satellite receiver, a BlueTooth module & the upper TV feed the Bose system. A TackVision TV5 stabilized system & a Directv receiver runs the TV in the salon & in the master bedroom. Each TV has a BluRay player. 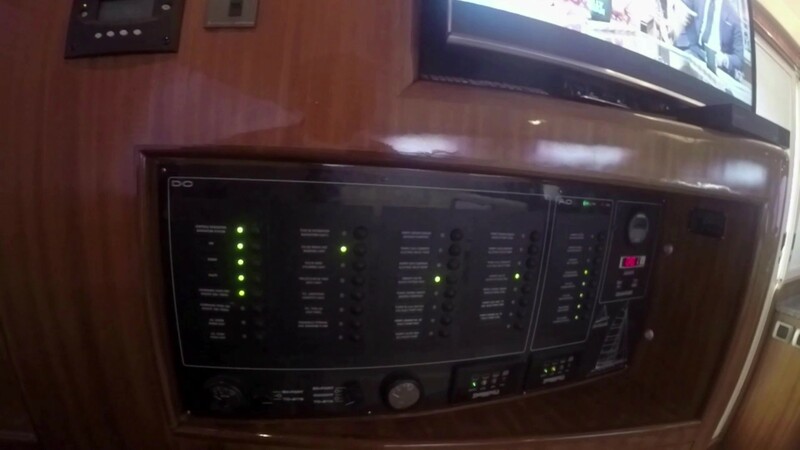 The TV’s are slaved together & controlled by a RF remote. 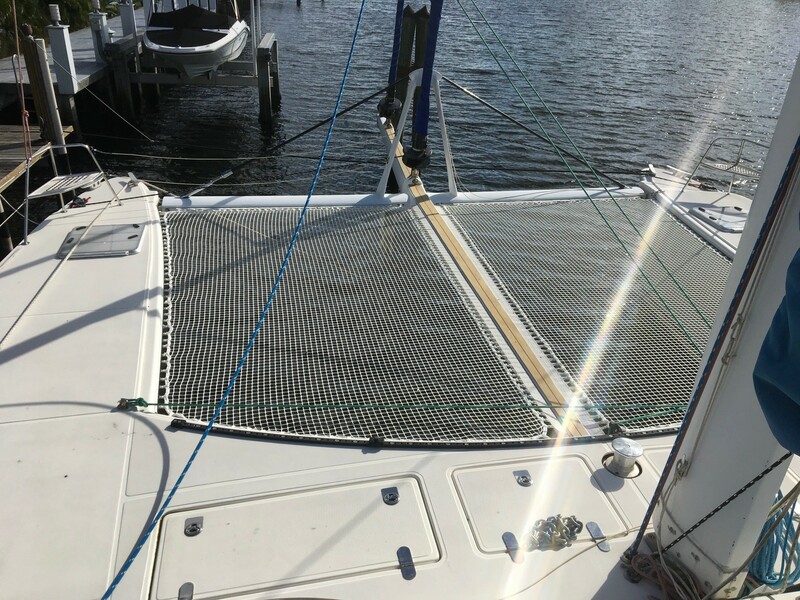 Sun shades: The Bimini has a sun shade (removable) on each side & one on the stern side, that unroll & attach to the life lines. The material, is semi lucent, allowing some light & wind through but providing good shade. Two large shades for the trampoline have also been built. 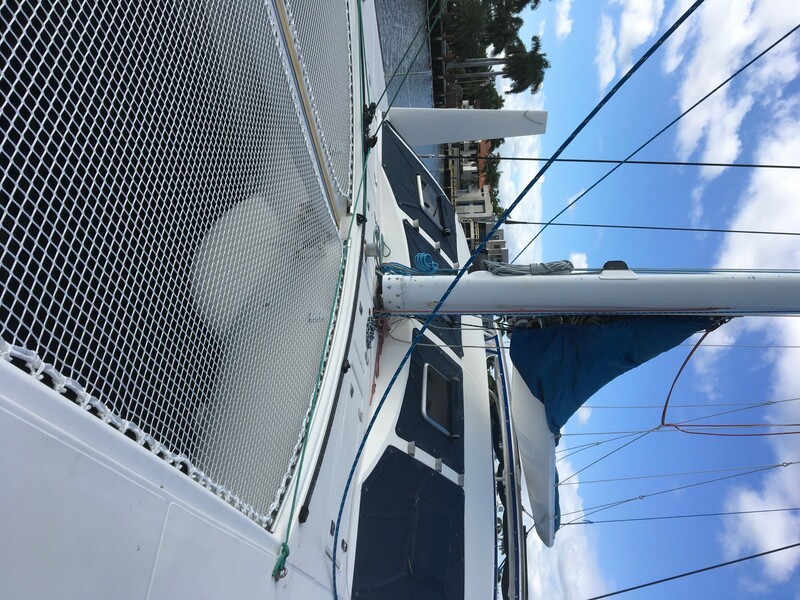 The first, The Manta, covers the aft half of the trampoline, raps around the mast, back to the first jack point on the boom. 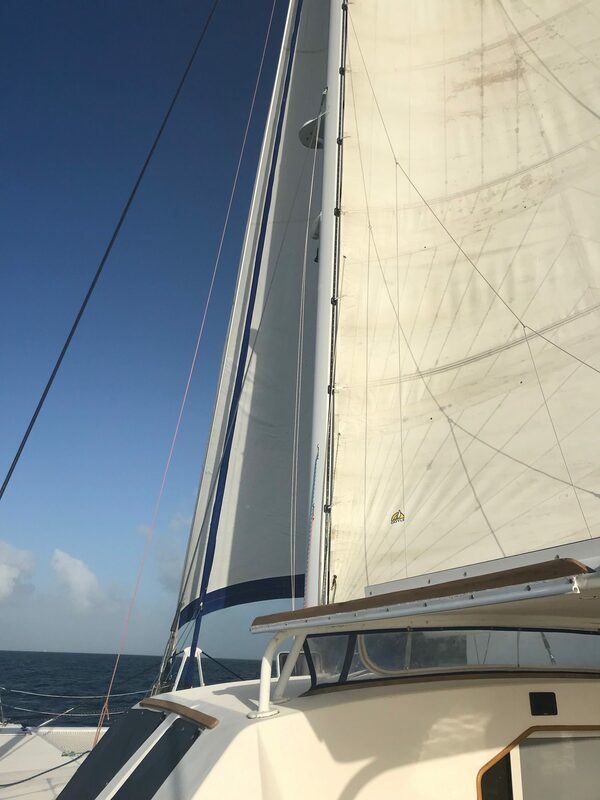 From there, it ties to the centerboard & then connects to the life lines forward. At anchor, this shades the forward house (salon) & funnels wind into the forward salon windows, cooling the boat. 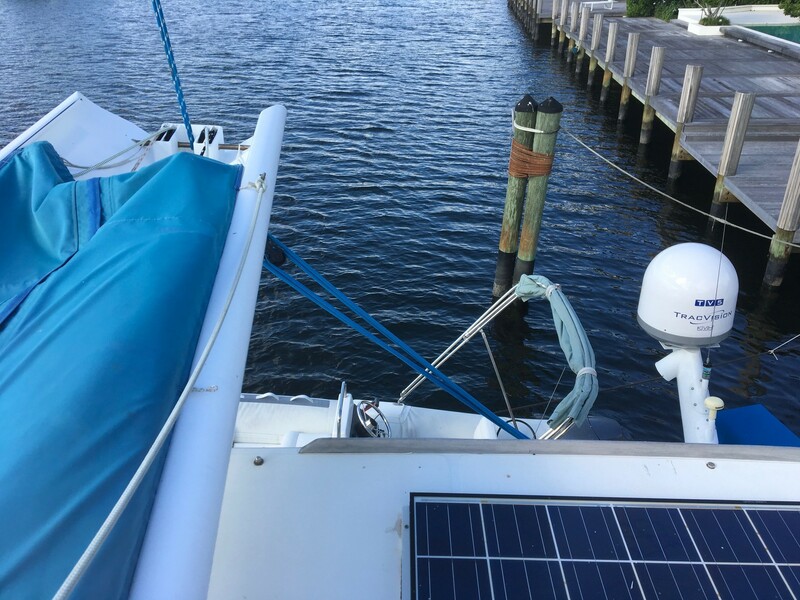 The second (flat rock) will shade the port or starboard half if the trampoline, allowing you to sail with the shade. 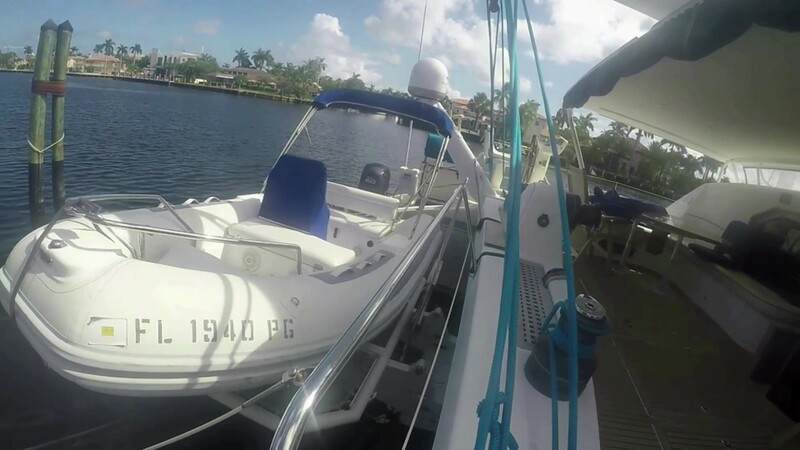 Anchoring: The main anchor is a Lewmar 88Lb Delta with 200 feet of 9/16 chain. A second 55Lb (not onboard) & a large Fortress (stored in an aft locker, some assembly required), round out the anchors. 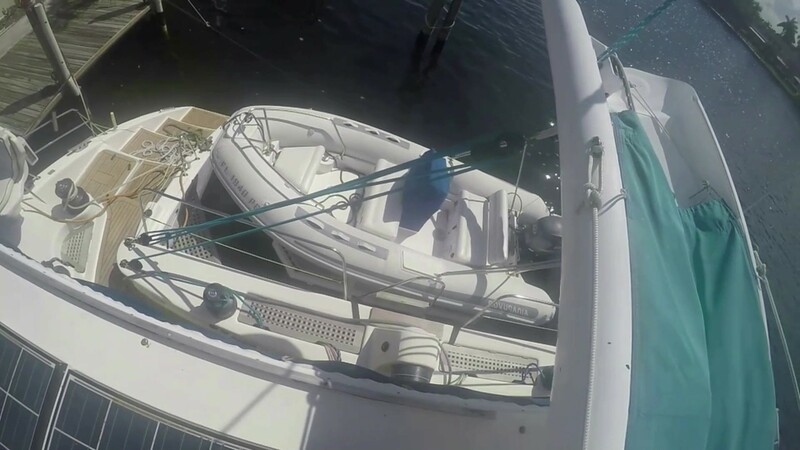 The windlass can support two anchors if desired. Masthead has a TriColor navigation light, an anchor light with strobe, Steaming light & forward deck light on the mast (Aqua Signal). 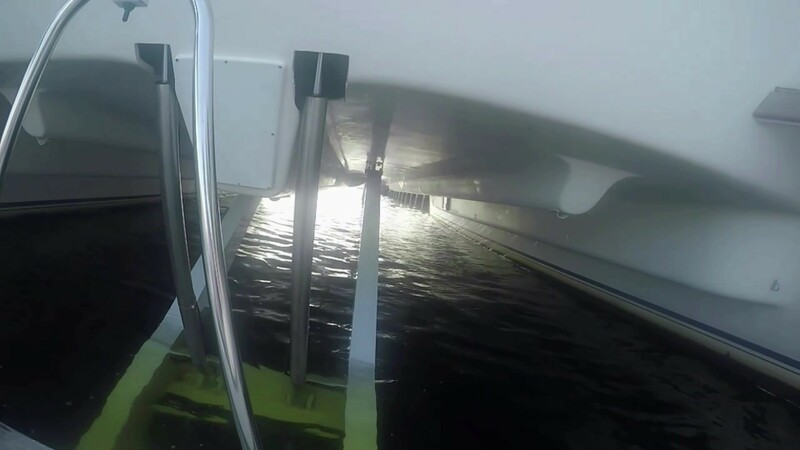 There is also a running light on the end of the bowsprit & a stern light on the aft mini tower. A switch under the couch near the navigation station controls which set of navigation lights are on & if the strobe will be on.